One afternoon in 2015, cinematographer Chris Stanley and I pulled our rental car into the dusty parking lot of the Arkadi Monastery. We were here to film the monastery for Seabourn, which offered a visit to these historical grounds on shore excursions from Heraklion and Chania. The Arkadi Monastery is such a beautiful place that you’d hardly suspect its tragic history. In 1866, nearly 1,000 people were taking refuge here against Ottoman invaders. When the invaders attacked the monastery, those inside made the ultimate sacrifice. They blew themselves up with gunpowder rather than surrender. 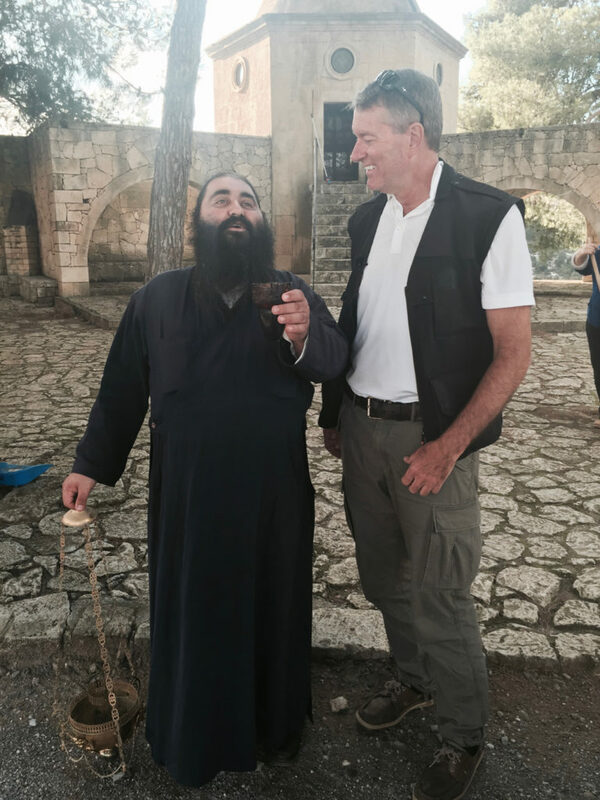 In Crete, I met a monk who surprised me. How? Read on. RoboCop, with apologies to its fans, is a 1987 movie starring Peter Weller, who played Alex Murphy, a terminally wounded cop who returned to his force as a powerful gun-wielding cyborg. Yes, I said to the monk, I do like RoboCop. He smiled and motioned for us to follow him into the monastery. My life has been full of such experiences. For the past 30 years, I have dedicated a large part of my professional life to cruise travel and the wonderful places, like the isle of Crete, where cruise ships deliver us, often for not nearly long enough to fully appreciate the place. As a journalist turned travel writer, my job took me out on more than 300 cruises, and on each one, I documented my experiences for magazines and websites, including two of my own, avidcruiser.com and rivercruiseadvisor.com. Now I know what you’re thinking. That’s a job? Sounds like a dream. Well, it was a dream. At times I felt that I needed to be pinched. I have been on some of the world’s most exclusive ships, luxuriated in lavish suites, enjoyed some of the best dining on earth, seen majestic sites – penguins and whales among them – and to be completely honest, have felt that I was being treated like a king in large part because of the power than the pen could wield. Lucky guy, you’re thinking. Yes, but my life didn’t start out that way. My father was a logger in North Carolina, and thinking that he was being a good father, enlisted me into logging at an early age. We’re talking before I was 10 years old. Gone were my summers, gone were my holidays, gone was my childhood. “When he wants to, Ralph can do the work of three men,” my father once bragged. Unfortunately, he was disappointed during the times that I did not want to do the work of three men. He could be hard, and ruthless. But logging was harder and more ruthless than he was. Harvesting timber took the lives of several of the men who worked with us or had worked with us. Others were mutilated by chain saws or broken by falling trees. Knowing that such fate lurked in the woods, I couldn’t wait to get out. Escape came to me on two wheels, not a motorcycle but a bicycle. I pedaled from the small town where I grew up, and a life of what felt like an indentured servant, across the United States and eventually, much of the world. After seven years of travel, I enrolled in college and departed five years later with a bachelor’s degree in journalism. My first job, lucky for me, was for a travel magazine, ASTA Agency Management, the official trade publication of the American Society of Travel Agents. At age 32, I had all the right stuff, more or less, and the editor sent me out to explore the world with a reporter’s notebook, pen and camera. One day the editor asked if I would like to go on a cruise. Cruise ships were something new to me, but I said sure, and that began what is now a nearly three-decade career that would eventually see me as The Avid Cruiser. My goal from the start was to think of consumers. After all, I was charged with being their eyes and ears. I launched a series of publications all with the same mission in mind: to provide consumers the resources they needed to help them make informed cruise vacation decisions. I had found a recipe for success. Today, my professional aspirations are still the same: to help people make good choices when it comes to their cruise vacations. Cruises are difficult to choose if you know little about them. Think about your own preferences. Do you want a big ship, small ship, expedition ship, river ship? Where do you want to cruise? What’s your budget? Do you want all-inclusive with a high cost of entry? Or do you want to be on a large ship with Broadway-style entertainment and lavish buffets? Are you traveling solo, as a couple, as a family, an extended family? Decisions, decisions, decisions. During the next dozen months, I’ll attempt to add some clarity to these questions in a novel way, while discussing my 12 favorite cruises. I’ll warn you ahead of time: Over the years, my tastes have grown somewhat sophisticated. By that, I don’t mean that I have a predilection for luxury. Rather, my favorites are often to places that most people either don’t get a chance to visit or don’t think they want to visit. Spoiler alert: Russia’s Far East was one of the best cruise destinations I’ve ever visited. You’ll read about that in a future post. Of course, I also rank the Greek Isles high on my list, along with the Baltic, particularly Stockholm with its beautiful archipelago. If I were to do the Caribbean again, it would be on SeaDream or a small ship similar to SeaDream. You’ll read about that too in the coming months. I’ll begin my series next month, however, with a destination that I am returning to for a third time. It’s a destination that takes some degree of courage, and a bottle of Dramamine. I’m talking about Antarctica. I’ll be sailing on Silversea’s Silver Cloud. You’ll hear all about that voyage in posts here on Avid Cruiser and in photos and video. For now, I’ll take you back to 2015, to that day that Chris and I were at the Arkadi Monastery. Enjoy the video that we produced for Seabourn, and if you ever get the chance, go there and visit yourself. And do yourself a favor. Sit for a couple of hours to watch Peter Weller as RoboCop. You never know. You may endear yourself to a particular monk who lives high up in the hills on the isle of Crete.